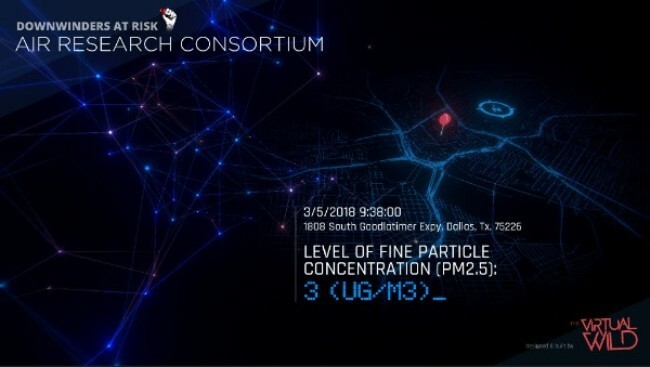 Downwinders is very lucky to have Dallas media lab The Virtual Wild and its artist-owner artist Jay Rutherford creating a special video display of the data we’ve collected with our new portable PM monitors for this year’s Earth Day X @Fair Park. Using a large 72- inch video monitor as his palette, Jay is painting with light and code to produce a really memorable exhibition. His mission: to make air pollution more interesting and show it new contexts and perspectives. This year we’ll be side-by-side with our partners at the DFW Air Research Consortium. 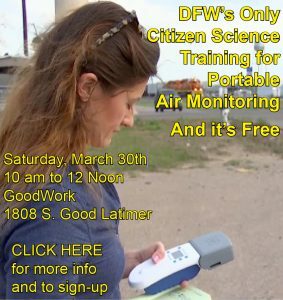 UTD scientists and others will be showing off their own monitor hardware and Downwinders will have its portable monitors to demonstrate as well. Come by and enjoy Jay’s handiwork and stick around to look at the equipment that’s changing the way public health is protected in North Texas.